Do you have a question about Lend A Box® that you’re afraid to ask us? As your second grade teacher always said, there are no stupid questions, but generally, they are the easiest to answer. Lucky for you, this isn’t school and we aren’t handing out grades. We are, however, handing out answers to the questions we are most frequently asked. If only your teachers had been that cool. How do I figure out how many boxes to order? For residential orders, we’ve put together suggested bedroom packages based on past client experiences. We have found that those packages meet the needs of about 90% of our clients. If you think you’re in the 10% who require additional boxes because you have lots of really cool stuff to move, then you probably will want to order a few more boxes. To make it easy, we’ve put together our most popular add-ons – the library package for those of you with lots of books and the kids package to hold the stuff that comes with having little mini-yous in the house. For wardrobe boxes, we suggest ordering one wardrobe for every two feet of hanging clothing you’d like to pack. For commercial orders, please complete a quote request or call our reservation desk. Each commercial job is a custom quote based on the move or project you are planning. Generally speaking, we recommend 4 large crates and 1 dolly for each desk area that is being moved. What if I need more boxes after my delivery? If you need additional boxes after your delivery give us a call and we’ll get them to you. How do I pay for my boxes and supplies? We accept VISA, MasterCard, American Express, and Discover. We’ll take payment when you order online or over the telephone. For corporate orders, invoicing is also an option. Will I receive a confirmation from Lend A Box® after I order my boxes and supplies? Yes, you will receive an e-mail confirmation upon placing your order. You will also receive an e-mail and a phone call the day before your delivery and pickup (Friday for Monday jobs) confirming the final delivery/pickup window, address, and other pertinent information. And of course, you can e-mail us at [email protected] or call us with any questions you may have. Can I pick up the boxes at your warehouse instead of having them delivered? Yes! Call us to arrange for a pickup or a return of the boxes at our Chantilly VA warehouse. Please keep in mind that these boxes do take up space, so you’ll need to have a car with seats that lay down flat, an SUV, minivan or truck with lots of room. We’ll take 15% off of any bedroom package and remove the delivery charge for non-package orders if you pick up and return the boxes at the warehouse. Can I change the drop-off or pick-up dates for the boxes? Absolutely! Should your plans change, simply call us to reschedule. We request at least 24 hours notice for schedule changes so we can efficiently plan our drivers’ schedules. Is there a cancellation fee if my plans change and I no longer need the boxes? We know that plans change. If you let us know at least 24 hours in advance that you no longer need the boxes, there will be no charge to you. Otherwise, we will charge you 20% of the cost of your order (hey, those boxes could have been used by someone else if we hadn’t put them aside for you!). What is a pirate's favorite letter? I know you think it’s the R, but it actually be the C.
We get just as annoyed as you do when we find extra fees added to a “final price.” So here’s the deal – deliveries and pickups are included in the residential package prices. For custom orders, corporate orders or folks who live outside our regular delivery areas, we will add a delivery/pickup fee to cover our labor and fuel costs – and that’s it. What if I need the boxes less than one week or more than four weeks? For residential orders, we rent boxes in week-long intervals. So if you need them for just a few days, we’re happy to pick the boxes up when you’re done, but we will still charge you for the full week’s rental price. For longer than four week rental periods, consider our flat rate packages. They have a longer rental periods built in for larger moves and renovation projects that need more than a month. Or contact us for monthly pricing. You can send an email to [email protected] or give us a call. For commercial orders, please complete a quote request or call our reservation desk. Each commercial job is a custom quote, and we have daily, weekly and monthly pricing available. I love these boxes! Can I keep them? Sure thing! And thanks for the love! Lend A Boxes may be purchased for $30 each. Plastic wardrobe boxes are $70 each. Dollies are $120 each. We’ve had some pretty crazy weather lately. What happens if there is a freak snowstorm or hurricane or earthquake on the day my boxes are to be delivered? We try to be prepared for anything while providing excellent customer service to our clients. That being said, we also care about the safety of our drivers. So we will do our utmost to get your order to you on time, but if we can’t do that safely, we will call you to reschedule. We ask for your patience and understanding if events outside of our control require us to reschedule your delivery. Do I have to be around when you deliver or pickup the boxes? Although we would love to meet you, if you have a safe space for the boxes that is easily accessible by our drivers (like on your driveway or patio), we can easily arrange for a delivery or pickup without you being there. If your apartment or condo community has a concierge, we are happy to coordinate delivery to or pickup from them as well. Just make sure that you let them know we are coming and provide us with specific instructions and contact information, so everything goes smoothly. How quickly can Lend A Box® deliver boxes to me? It’s best to schedule your delivery and pickup as soon as you know your dates to ensure you get the time slot you want. But we will strive to accommodate everyone’s requests, including short notice requests. When possible, we provide same day delivery, which has an additional fee of $25.00. Which neighborhoods do you currently service? We provide services in Northern VA, the DC suburbs of Maryland, Washington DC and Raleigh NC. We are expanding our service areas regularly. Using eco-friendly plastic moving boxes is definitely the best way to move. Lend A Box has been helping folks move to a better environment since 2012, and since then we have seen several other companies do the same thing. Check the list below if you need to rent boxes in your city! Why did the cowboy get a weiner dog? Because he wanted to get a long little doggie! I live on the fifth floor of an apartment building. Will you deliver the boxes to my door? Yes, we will – and there is no extra charge for the sweat! What if my dog destroys or damages a box or other rental item during my move? We won’t put you (or your dog) in the doghouse – we’ll just charge you the replacement cost ($30 per Lend A Box®, $70 per wardrobe box, and $120 per dolly). We rent 100% recyclable plastic boxes in multiple sizes, wardrobe boxes, and dollies. Labels and security ties are included with the rental. We also sell packing supplies that can be conveniently delivered with your rental equipment. How do you estimate the airspeed velocity of an unladen swallow? There are other choices for renting boxes. Why should I choose Lend A Box®? We are a customer-service oriented business that also happens to deliver boxes. Our number one commitment is to reduce your stress. How do we do that? We make ordering online or over the phone easy. If you have a question, give us a call – we’ll answer the phone! We will confirm all the details via a confirmation e-mail and give you a phone call the day before we see you. We will adjust your order as necessary to get you what you want. Our drivers show up when we promise (or we’ll call you to let you know what’s going on). There are no surprises with Lend A Box! Your time is valuable! We offer one-hour (instead of two or more hour) delivery windows. Cleanliness is next to … your clothes! We clean and sanitize each box every time it comes back to our warehouse before sending it out again. Our cleaning crew hand washes your boxes, removes labels and inspects them before they go out again. Size matters! Our standard box (27″x17″x12″) provides 3.2 cubic feet of space. But sometimes smaller is better, which is why we also include a few of our small boxes (about the size of a bankers box) in each package for your heavy stuff. Our small boxes are 2.4 cubic feet. For those of you who want to impress the neighbors (or perhaps just pack bulkier items), we also offer extra large boxes (28″20″x15″), which are 4.86 cubic feet. Do you rent boxes for corporate moves or renovations? For commercial orders and renovation projects, please complete a commercial pricing quote request or call our reservation desk. Each job is a custom quote based on the move or project you are planning. What are the benefits of using a Lend A Box® instead of cardboard? Lend A Box® saves you time and money by delivering the boxes to your door and picking them up after your move. You avoid purchasing, assembling, breaking down, and disposing of cardboard boxes. One ton of cardboard is eliminated from landfills for every 10 four-bedroom packages or 50 studio packages rented from Lend A Box® . Lend A Boxes are made from 100% recyclable plastic. A Lend A Box® is used hundreds of times before being reground into another Lend A Box®. Cardboard boxes are typically used once or twice in their lifetime before ending up in a landfill. Producing one ton of cardboard requires 17 trees, 79 gallons of oil, 7,000 gallons of water, and 42,000 kilowatts of energy. By using our plastic boxes instead of cardboard for residential moves, Americans could save over 400 million gallons of oil, about 120 million trees, and almost 65 million cubic yards of landfill annually. Lend A Boxes are more sanitary than cardboard boxes because they do not let in rodents or moisture (which leads to bacteria and mold). Lend A Boxes are cleaned and disinfected between each use. Lend A Boxes are more space-efficient than varying sizes of cardboard boxes when packing a moving truck. Lend A Boxes will not collapse. They are stronger and able to have more weight stacked on top of them than cardboard boxes. Our boxes are crush-proof. The large boxes are eight pounds empty, which means there is some serious armour around your valuables while they are in transit. Although the lids can hold up to 100lbs, no one wants to carry a heavy box! You don’t need to pack them that heavy. Lend A Boxes will not shift as easily as cardboard boxes will during transport. You don’t ever need to worry about mold, bugs, leaks, mud, or goo. Why is a Lend A Box® a better choice than a previously used cardboard box? Previously used cardboard boxes are a cheaper alternative and certainly better for the environment than using new cardboard boxes. But you still might not want to put your personal belongings in them. Old boxes could have been sitting in storage for a long period of time, exposing the boxes to rodents and insects such as bed bugs; or they could have gotten damp, allowing bacteria and mold to grow. Eeeeewwwwww… And if you’re the kind of person who actually wants to use the stuff you pack after you get to your new place, you should know that cardboard boxes can collapse after only one or two uses. Lend A Boxes are used hundreds of times with no loss of strength, increasing the likelihood that your Great Aunt Millie’s prized salt and pepper shakers will arrive at your new place in tact. How are Lend A Boxes different from plastic boxes I can purchase at the store? Lend A Boxes are made of industrial strength plastic that will not shatter or collapse under the weight of heavy boxes on top of them. Plastic boxes available in the home storage areas of stores selling to the general public are not anywhere close to being as strong as a Lend A Box, as they are not made with the same type of plastic. They will shatter and they will collapse under heavy weight. Moreover, they are smaller in size than our standard boxes, so you’d need to get many more of them to pack up. Are Lend A Boxes clean? Do I need to worry about bugs or mold? We clean and sanitize each box before each use to give you the happiest moving box experience possible. Even better, Lend A Boxes are 100% bug-free and mold-free guaranteed. Are there any restrictions on what I can put in the Lend A Boxes? Use common sense and don’t pack flammable items in the boxes. Other than that, pretty much anything can go into a Lend A Box®, but remember not to over pack and bend with your knees, not your back! Is Lend A Box® a moving company? No. We provide the supplies you need to make your move easy and seamless. We do know lots of moving companies, however, so ask us for recommendations. Will Lend A Box® also pack and move my boxes? No. Arranging for the packing and moving of your boxes is your responsibility. After all, we don’t want to take away all of your moving fun. If you really want to let someone else have all the fun, ask us for recommendations. Why shouldn’t you criticize someone until after you’ve walked a mile in their shoes? Because that way, when you criticize them you’ll be a mile away and you’ll have their shoes. My movers are packing for me. Can I still use Lend A Boxes? Absolutely! In fact, professional movers love using Lend A Boxes because of their uniform size, strength, and stack-ability. We are happy to recommend great movers if you need one. I plan to remodel my home. Can I use Lend A Box to pack my stuff? Yes! We can provide boxes for your remodel or renovation. We can also recommend great remodeling companies. Do you recycle Lend A Boxes? Yes. Once a Lend A Box®’s useful life is over, the box is reground and reincarnated as a spanking new Lend A Box®! This is such a cool company. Is Lend A Box® offering franchising opportunities? We are not a franchise, but we are expanding and would love to talk to you about how you could work with us. Give us a call! Is Lend A Box hiring? We are always looking to hire hard-working individuals who are excited to join a company with huge growth potential. Sometimes Lend A Box team members tuck their knees into their chests and lean forward. That’s just how we roll around here. We provide storage services for clients in Northern VA. Presently we are working in Alexandria, Arlington, Fairfax County, Loudoun County and Prince William County. What are the costs for getting the crates and items to and from storage? There is no charge to receive empty boxes. We will pickup the first collection for free. Our standard re-delivery fee is $35 any time we deliver some or all of your items back to you. If you anticipate that you will need multiple re-deliveries a month, please call our reservation desk to discuss custom pricing options. Rent starts the day an item is stored in our warehouse. Keep our crates as long as you need to pack them. The rent starts either on the day we pick the packed crates up or seven days after we deliver the empty crates, whichever comes first. We require certain items to be boxed prior to sending them to our warehouse. We will provide you with the cardboard necessary to do the job. The rent starts either on the day we pick up the packed cardboard boxes, or seven days after we deliver the empty cardboard boxes, whichever comes first. The rent starts on the day we pick up the items and store them in our warehouse. Is rent prorated if I only store for part of a particular month? Rent is charged on a monthly basis and is not prorated. Yes, the driver will lock the crates with a tamper-proof seal. We also will put a seal on the cardboard boxes. What are the weight limits on what I can store? 40lbs is the weight limit. For any items over their respective limit, we may ask you to repack. Do not put more than a few books in any one box or container. Pack only pictures and artwork in the picture boxes. Pack only hanging clothes in the wardrobe boxes. What items are prohibited in storage? Do not pack and store prohibited, illegal, stolen or perishable items. Prohibited Goods include but are not limited to the following: anything illegal for you to possess; plants; any food; creatures (whether living or dead); flammables, firearms, weapons or explosives of any kind; chemicals, hazardous or toxic materials of any kind; items which emit any kind of odor, liquids, noise or fumes; compressed gases; any currencies, bonds or securities; or any item of high value such as jewelry, antiques, fine art, fine wines, any currencies or precious metals.Do not pack and store prohibited, illegal, stolen or perishable items. Prohibited Goods include but are not limited to the following: anything illegal for you to possess; plants; any food; creatures (whether living or dead); flammables, firearms, weapons or explosives of any kind; chemicals, hazardous or toxic materials of any kind; items which emit any kind of odor, liquids, noise or fumes; compressed gases; any currencies, bonds or securities; or any item of high value such as jewelry, antiques, fine art, fine wines, any currencies or precious metals. Can I pack fragile items? You really should carefully pack any fragile items using protective cushioning! Paper, foam sleeves, and bubble wrap are great for protecting glassware and dishes. We recommend using anti-static bubble wrap and stretch wrap for electronics. Cardboard picture corners are a good idea for mirrors and framed artwork. Will you pack the crates for me? No, we leave the fun part to you and your friends. We do, however, provide you with free packing materials for some specialty items. Can I store my own boxes and plastic storage containers? No. Even though you may have super cool plastic containers of your own, not all containers are made the same. Most store bought bins cannot withstand the weight requirements for long term storage. 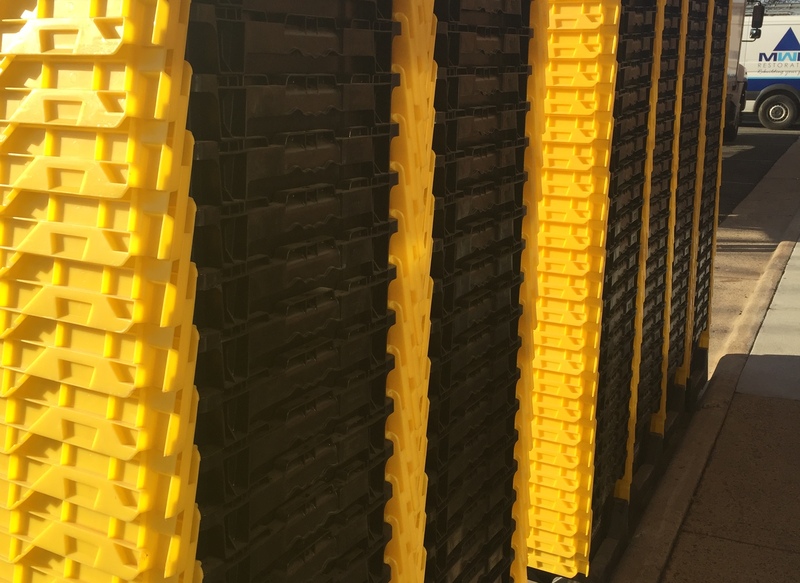 We do not want your items to be crushed, so you need to use our industrial strength plastic crates which are included in the price of your rental. We provide new cardboard free of charge for items that need to be boxed that will not fit in our plastic crates. We will accept new cardboard boxes only, not previously used ones. Cardboard has a limited lifespan and we do not want the integrity of the boxes to be compromised during storage. Can I retrieve individual items from storage? Yes! Each crate and item is assigned a unique tracking number which is also associated with your account. Add a description or list of items for each storage crate into the online inventory when you are packing. You can upload one picture associated with each crate. Using your online account, you can request any individual crate or item to be re-delivered. How quickly can I get my items back from storage? If you need your items back faster than our normal delivery times, call the Reservation Desk and we’ll do our very best to accommodate you. Premium delivery charges will apply for expedited or after-hours deliveries. Can I rent crates for my move and then use them for storage afterwards? Yes. Let our reservation desk know that you would like to send some of the crates to storage after you move. Box rentals and storage rentals are handled separately from a billing perspective. But from a scheduling perspective, we can customize the empty box returns and storage logistics to your needs. We will set up a client account for you, so you can start building your inventory and descriptions on line as you pack. We’ll pickup up the full crates and take them to storage. Rent for the storage will start on the day we pickup the crates. Where is your storage facility? Our storage warehouse is located in Chantilly, VA.
Can I come to the storage facility? No. We do not allow access to our storage warehouse. It is your responsibility to insure your possessions. We recommend that you add any items in storage to your renter’s or homeowner’s insurance policy. That being said, we will cover up to $100 replacement value per crate.